Walter Isaacson, presidente del Instituto Aspen, ha sido presidente de la CNN y director ejecutivo de la revista Time. Es autor de Einstein, su vida y su universo (Debate, 2008), Benjamin Franklin: An American Life y Kissinger: A Biography, y es coautor, con Evan Thomas, de The Wise Men: Six Friends and the World They Made. Vive con su mujer en Washington, D.C.
Walter Isaacson is the CEO of the Aspen Institute, has been chairman of CNN and the managing editor of TIME magazine. He is the author of Benjamin Franklin: An American Life and of Kissinger: A Biography, and the coauthor of The Wise Men: Six Friends and the World They Made. He lives in Washington, D.C. with his wife and daughter. Norwalk, Connecticut: Easton Press. 2007. First Edition; First Printing. Hardcover. Fine, Accented in 22kt gold, printed on archival paper with gilded edges, smyth sewing & concealed muslin joints. Bound In full leather with hubbed spines. Pristine. ; Signed limited Edition complete with a Certificate of Authenticity issued from the publisher. ; 8vo 8" - 9" tall; Signed by Author . 2009-04-01. New. Ships with Tracking Number! INTERNATIONAL WORLDWIDE Shipping available. Buy with confidence, excellent customer service! Simon & Schuster, 2007. First Edition. Cloth & Boards. Fine - As New/Fine in Archival Plastic Cover. A handsome First Edition, First Printing signed by the author on the title page and with number line 10 9 8 7 6 5 4 3 2 1. In burgundy and cream cloth & boards in fine unread condition. In a fine complete dustjacket protected by an archival plastic cover. By the author of "Benjamin Franklin: An American Life." A beautiful copy. New York: Easton Press. As New. 2007. Signed Edition; First Printing; Signed by Author. Full-Leather. A special Limited edition, SIGNED by author Isaacson Walter. 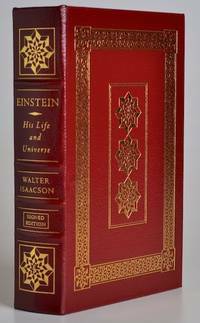 A wonderful scarce book in As New condition, never taken out of its original shrink-wrap; Using personal letters and papers of Albert Einstein's that have only recently become available, Walter Isaacson has written a full biography of the great physicist. Einstein's rebellious nature, creative spirit, and innovative thinking caused him to question accepted doctrine and eventually to rewrite the laws of the universe Contains all of the classic Easton Press trimmings: premium leather, silk moiré end leaves, distinctive cover design, raised bands, accented in real 22KT gold, satin ribbon page marker, gilded page edges, long-lasting, high quality acid-neutral paper, sewn pages for strength and durability . Simon & Schuster Ltd. PAPERBACK. 1847390544 Brand new book.Buy with confidence. Money Back Guarantee.Expedite Shipping Available. International shipment available. . New. 2007-04-09. New. Ships with Tracking Number! INTERNATIONAL WORLDWIDE Shipping available. Buy with confidence, excellent customer service! 2014-11-01. New. Ships with Tracking Number! INTERNATIONAL WORLDWIDE Shipping available. Buy with confidence, excellent customer service! 2018-08-07. New. Ships with Tracking Number! INTERNATIONAL WORLDWIDE Shipping available. Buy with confidence, excellent customer service! Easton Press, 2007. Gilt-stamped full red leather, moire endpapers, a.e.g, LIKE NEW. Signed by Isaacson. Includes certificate of authenticity and an unused Easton Press bookplate laid in. Photos available upon request. 2007-07-01. New. Ships with Tracking Number! INTERNATIONAL WORLDWIDE Shipping available. Buy with confidence, excellent customer service! 2012-06-03. New. Ships with Tracking Number! INTERNATIONAL WORLDWIDE Shipping available. Buy with confidence, excellent customer service! Easton Press, 2007-01-01. Leather Bound. Like New. Signed. Signed by the author (no inscription), full leather, gilt decoration and lettering, cover has no flaws, ribbon marker, text is bright and unmarked, binding is tight. Brick and mortar bookshop since 1975! 2017-05-11. New. Ships with Tracking Number! INTERNATIONAL WORLDWIDE Shipping available. Buy with confidence, excellent customer service! 2017-04-11. New. Ships with Tracking Number! INTERNATIONAL WORLDWIDE Shipping available. Buy with confidence, excellent customer service! 2008-04-26. New. Ships with Tracking Number! INTERNATIONAL WORLDWIDE Shipping available. Buy with confidence, excellent customer service! 2017-05-11. Good. Ships with Tracking Number! INTERNATIONAL WORLDWIDE Shipping available. May not contain Access Codes or Supplements. May be ex-library. Shipping & Handling by region. Buy with confidence, excellent customer service! Simon &amp; Schuster Audio, 2007. CD-Audio. New. 5.75 x 5.13 cm. Andr Deutsch. Hardcover. 0233002715 New Condition. . New. Andr Deutsch. Hardcover. 0233002715 Like New Condition. . Fine. 2014-11-01. Good. Ships with Tracking Number! INTERNATIONAL WORLDWIDE Shipping available. May not contain Access Codes or Supplements. May be ex-library. Shipping & Handling by region. Buy with confidence, excellent customer service! 2012-06-03. Good. Ships with Tracking Number! INTERNATIONAL WORLDWIDE Shipping available. May not contain Access Codes or Supplements. May be ex-library. Shipping & Handling by region. Buy with confidence, excellent customer service! 2007-09-02. Good. Ships with Tracking Number! INTERNATIONAL WORLDWIDE Shipping available. May not contain Access Codes or Supplements. May be ex-library. Shipping & Handling by region. Buy with confidence, excellent customer service! Editorial Debate, 2009-01-09. Tra. Hardcover. Used:Good. New York: Simon & Schuster, 2007. First Printing [Stated]. Hardcover. Very good/very good. xxii, 675,  pages. Illustrated endpapers. Frontis Illustration. Main Characters. Illustrations. Sources. Notes. Index. Slight wear to DJ. Autographed sticker on front of DJ. Signed by the author on the title page. Walter Isaacson (born May 20, 1952) is an American writer and journalist. He is the University Professor of History at Tulane University. He has been the President and CEO of the Aspen Institute, a nonpartisan educational and policy studies organization based in Washington, D.C., chairman and CEO of CNN and Managing Editor of Time. He has written biographies of Leonardo da Vinci, Steve Jobs, Benjamin Franklin, Albert Einstein, and Henry Kissinger. Isaacson began his career in journalism at The Sunday Times of London, followed by a position with the New Orleans Times-Picayune. He joined Time magazine in 1978, serving as the magazine's political correspondent, national editor, and editor of new media before becoming the magazine's 14th editor in 1996. Derived from a Kirkus review: A comprehensive and marvelously readable life of the eminent scientist-and more, the eminent counter-culturalist, rebel, humanist and philanderer. Brave enough to tread on such highly specialized ground, and working with newly available archival materials, Isaacson lucidly explains the finer points of Einstein's theories. The general theory of relativity, had its birth, Isaacson writes, while Einstein was struggling to write an article on his special theory of relativity; sitting in his office in Bern, where he was a patent-examiner, he had the thought, "If a person falls freely, he will not feel his own weight"-"the happiest thought in my life," Einstein recalled-but underlying it was formidable work in physics and mathematics that took Einstein many subsequent years to express, and Isaacson acquits himself very well in taking readers along some strenuous paths of reasoning. Along with the science, Isaacson gives us an Einstein with whom it might have been fun to enjoy a stein of beer. DEBATE. PAPERBACK. 987178693X . New. 2015. Editorial Debate. Hardcover. 8483067889 . New. 2014. Large Print Press, 2008-05-01. Paperback. Used:Good. Debolsillo, 2012-10-30. Tra. Paperback. Used:Good. Simon & Schuster, 2007-04-10. Hardcover. Like New. INSCRIBED by the author; clean copy with little to no cover wear. Minor curling at top of spine. No markings, folds or rips to pages.MDJ. New York. : Simon & Schuster, 2007. Book. As New. Hardcover. 1st Edition. First Edition/First Printing. Hardcover in unclipped dustjacket. 675 pages, with photographs, sources notes, and index. A highly acclaimed biography of Albert Einstein, that has become the definitive one. Frontispiece photograph of Einstein. A fine dustjacket over a fine book. As new. Unread. From my smoke-free collection. Ships in well-padded box..
Andre Deutsch. Hardcover. 0233005471 . New. 2014.